Are you sick of your long hair getting in the way of your daily life? Or, perhaps, your hairdresser cut your hair that little bit shorter than expected, leaving you unsure of how to style your new bob? Whether you’re a woman with long, medium or short hair, a messy bun will ensure you always look gorgeous. With a vast variety of options available to suit any occasion, this easy-to-achieve style can be worn with confidence from day to night. 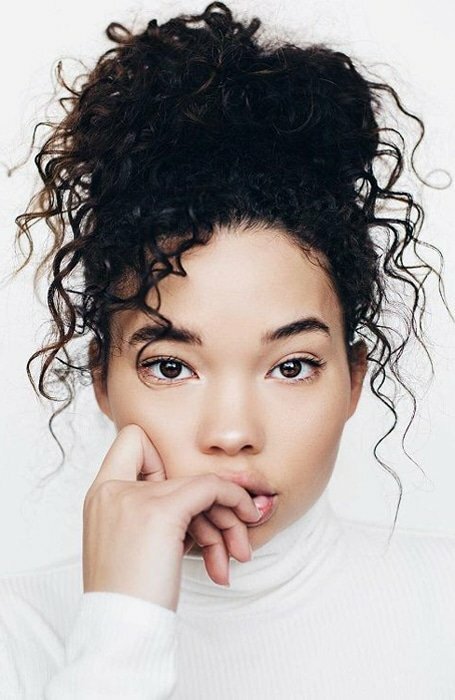 To help you select the most flattering messy bun look for you, we’ve investigated all the options and curated a selection of the best of the bunch. Here’s our guide to gorgeous messy bun hairstyles for every hair length. If you’ve opted for a bold set of bangs as your hairstyle of choice this season, complement your look with a messy high bun. By pulling your long hair up off the shoulders, it will allow those elegant bangs to frame your face. Not only is this look easy to achieve, but the dual, alluring aesthetic of playfulness and seductiveness makes it a winner for any occasion. Dress it down with a white tee and denim jeans for a casual, daytime look. Later, turn up the heat with statement earrings, luscious red lips and a little black dress. For petite women looking to add some extra height, or taller ladies seeking to elongate their figure further, a high, messy bun will work wonders. This sculptural style requires the hair to be pulled slightly tighter than usual to ensure it remains fixed atop the head. The result, however, is worth it, as wearers of this look instantly adopt the elegance and grace of a ballerina. As a result, this is the ultimate look when it comes to laidback sophistication. If you’re a girl who likes a little glitz and glamour in her life, then this is the messy bun option for you. 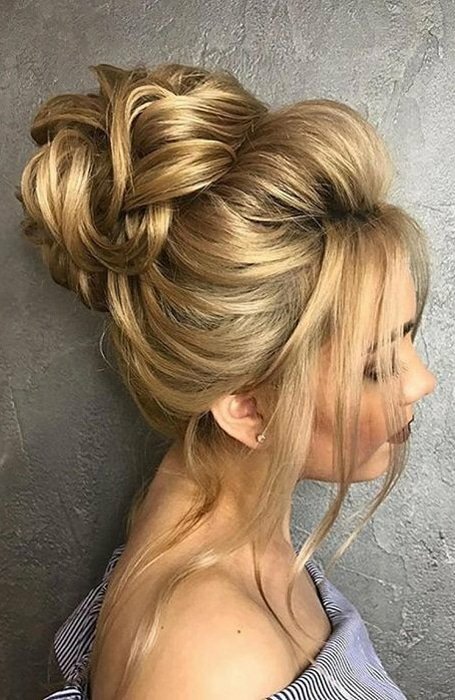 Although it may look effortlessly beautiful, the voluminous hair and interwoven style of this bun will take a little extra time and practice to achieve. Once you’ve nailed it, however, we guarantee it’ll become your new go-to for both work and play. For a more corporate, formal approach, keep the hair outside the bun pulled back off the face. Then, as you leave the office, slip on some heels and rearrange your ‘do so that wispy, floating strands of hair frame your face. Doing so will transform your look into the stunning “I woke up like this” style. Although we wouldn’t normally champion the doing of things half-way, we are firm supporters of the half-up messy bun. For long-haired women, this look presents the best of both worlds as it gets that mane up off your face while showcasing your cascading, luscious locks. By pulling back the hair, this has the added effect of naturally highlighting your cheekbones and eyes. As a result, this casual, flirty bun is perfect for daytime events. Whether that involves brunch with the girls, dancing at a day-fest or walking your pup at the local park, this look will ensure you’re ready for whatever comes. 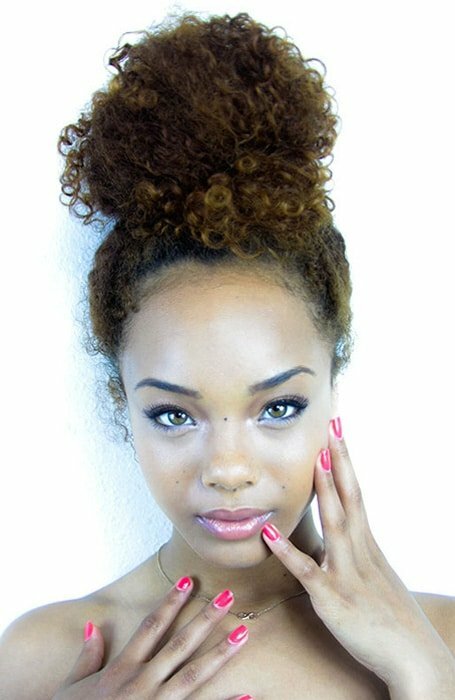 If you have a glamorous, gorgeous afro, then you’re all set when it comes to creating a fantastic messy bun. The natural curls and volume of your hair mean that your bun will be fabulously big, textured and bold. To give full effect to this style, pull the hair back tightly to concentrate volume into the knot. We also recommend keeping your bun pulled high, so that it balances beautifully on your head, creating a ballerina effect. The simplest form of the messy bun, the aptly named ‘easy messy bun’, can be mastered by even the clumsiest of hair grooming girls. First, gather up all of your hair into your hands until you’ve formed a basic, high ponytail. Then, wrap the length of this ponytail haphazardly around its base. Finally, secure with a loose elastic before using your hands to tousle the style. Draw extra attention to bouncing, beautiful curls by pulling them back into a loose, messy bun. When it comes to creating this look, let any runaway tendrils or curls flow free to highlight the natural wave of your hair. 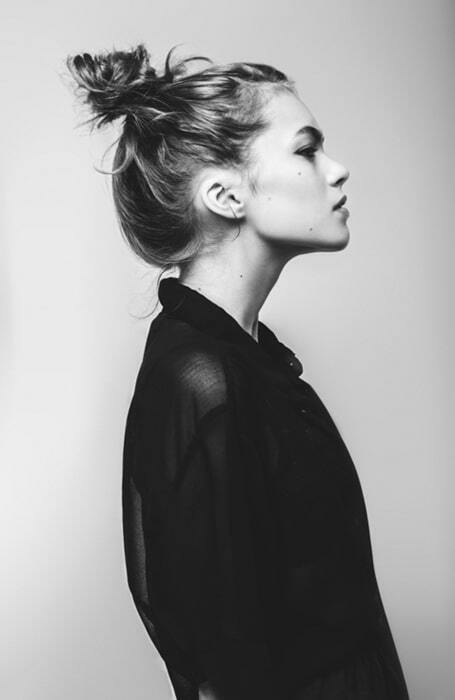 Luckily for you, this style of bun looks equally amazing when styled high, low or in-between. If you don’t have naturally curly hair, a curling iron will be your secret weapon for achieving this versatile look. Whether you wear it down the street or the wedding aisle, we guarantee this charming style will have heads turning your way. The top-notch top-knot is a simple variation of the high, messy bun. This cute, casual look is perfect for revealing a fresh complexion, sharp cheekbones and dazzling dimples. Therefore, show off your face’s best features with this no-nonsense hairdo. The best part about the look is that it leaves your face free to be showcased. As a result, whether you opt for a dewy, natural makeup approach, or go for glamour and definition, your face will be illuminated by this carefree style. For an elegant, fairytale hairstyle fit for a princess, we recommend a messy side bun with braids. The added detailing of thick, interwoven braids adds an extra charming element to this romantic, gorgeous style. Consequently, it is a leading messy bun option for women with medium length hair seeking a little magic for special occasions. Add a splash of colour to your go-to festival hairdo this season by weaving some vibrant hair wraps or braids into your messy bun. For extra emphasis, experiment with adding feathers or beads to your hair wrap. Finally, pile that bun high up on your head to ensure you stay cool while dancing away the day (and night). If you’re currently sporting a long bob or shoulder-grazing hairstyle, don’t feel like you’re missing out on the bun trend. There are still a wide variety of gorgeous messy buns that you can try. One simple option to experiment with involves pulling the hair back into a simple knot positioned in the middle of the back of the head. Then, free a few wispy strands from the front to frame your face to nail this cute messy bun look. Create an illusion of length with a low messy bun this season. This style, which sits at the nape of the neck, allows short-haired girls to make the most out of their locks. If you’re sporting bangs with your bob, let these fall freely across your face to add a soft and delicate beauty to this simple style. 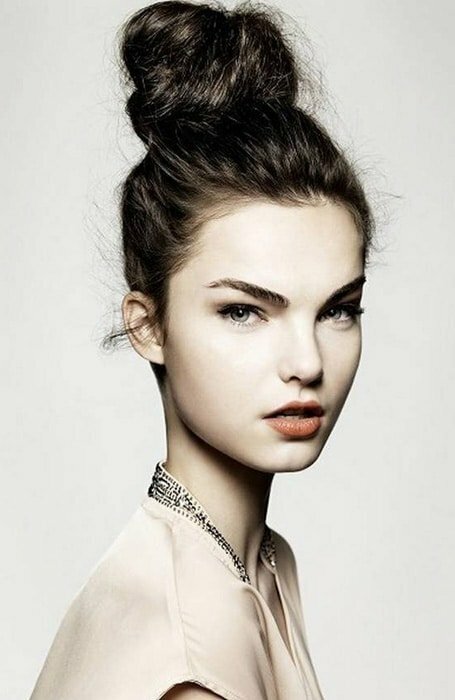 If you have naturally thin hair, a messy bun can help add a little extra definition and texture. To create an illusion of fullness, make sure to keep your bun loose. Doing so will also protect your hair, as it will prevent any breakage that could result from tightly pulling the hair back. The lovechild of a traditional low messy bun and a decadent chignon, the sophisticated messy bun is the epitome of effortless beauty. To create this look, use your brush and texturising spray to create volume up top. 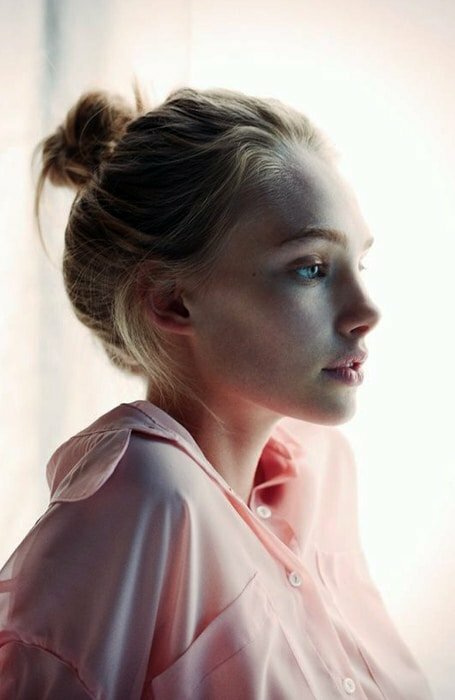 Then, pull your hair back into a low, messy bun, before tucking this bun in under itself and securing it with a hair tie. If you have thick hair, a few carefully positioned bobby pins or some hairspray will help lock this bun in place. The result is a sleek, sophisticated and ultimately stunning look that transcends time. When it comes to working out, no one wants hair in their face. Whether you’re strengthening your core in a reformer pilates class or running on the treadmill, a sporty messy bun will ensure you can remain focused and reach your fitness goal while looking great. The aim of this look is to get that hair off your face so you can stay cool throughout your workout. The fact that it will also look good at your post-gym brunch is a bonus. Ready to rock a gorgeous messy bun but not sure where to begin? This step by step tutorial will help you untangle all of your confusion, and teach you how to create six different beautiful buns.